Since the peptidyl arginine deiminase of Porphyromonas gingivalis is able to citrullinate peptides and proteins, various studies have suggested the species as a possible link between periodontal disease (PD) and rheumatoid arthritis (RA). This systematic review including meta-analysis was aimed to evaluate whether differences in terms of antibody titers against P. gingivalis exist between RA patients and systemically healthy individuals with and without PD. The following focused question was addressed: Are the antibody titers against P. gingivalis of RA patients different from systemically healthy individuals with and without PD? A systematic data search was conducted in MEDLINE and EMBASE. The collected data underwent a meta-analysis to detect statistically significant differences in terms of antibody levels between the groups. From 114 articles found by the search 13 articles met the inclusion criteria and provided data suitable for meta-analysis. 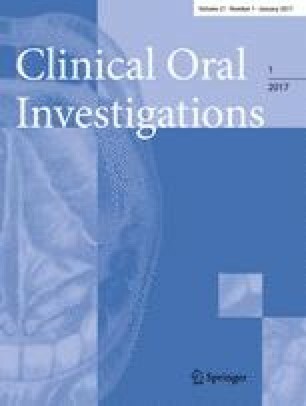 After analyzing various levels of confinement the meta-analysis revealed a statistically significant higher antibody titer against P. gingivalis in patients suffering from RA in comparison with systemically and periodontally healthy controls (p < 0.01) and systemically healthy patients with PD (p < 0.01). The present findings indicate that RA is often accompanied by the presence of an immune response against P. gingivalis. The significantly higher antibody response to P. gingivalis in comparison to systemically healthy individuals supports the link between PD and RA by P. gingivalis. Screening of the regularly taken blood samples of RA patients for P. gingivalis antibodies may help to sensitize rheumatologists and RA patients for improving periodontal health. The authors acknowledge the work of Bernadette Rawyler, School of Dental Medicine, Resort Multimedia, University of Bern, in preparing graphs. The study was funded by the European Commission (FP7-HEALTH-F3–2012-306,029 “TRIGGER”). Author Philip Bender declares that he has no conflict of interest. Author Walter B. Bürgin declares that he has no conflict of interest. Author Anton Sculean declares that he has no conflict of interest. Author Sigrun Eick declares that she has no conflicts of interest.